The National Prescription Drug Take Back Day aims to provide a safe, convenient, and responsible means of disposing of prescription drugs, while also educating the general public about the potential for abuse of medications. 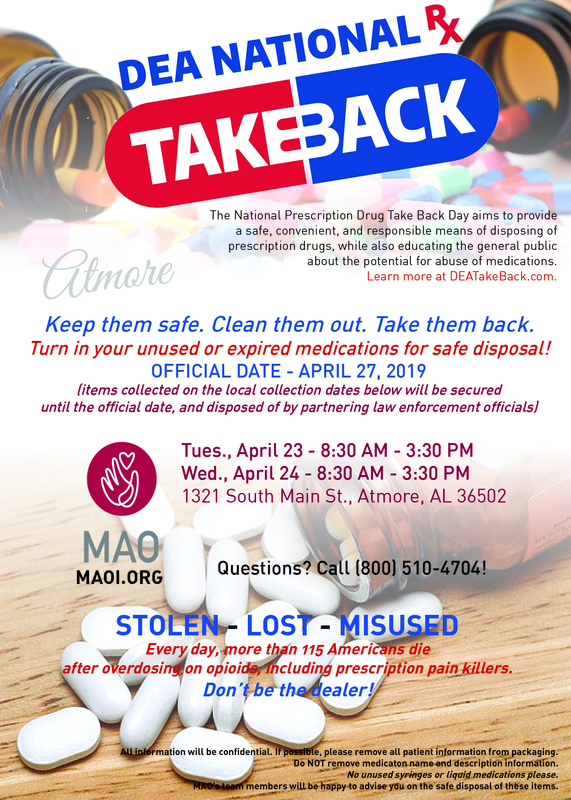 Medical Advocacy and Outreach (MAO) of Alabama is sponsoring National Prescription Take Back Day events in Atmore, Dothan, and Montgomery where you can turn in your unused or expired medications for safe disposal. See event details below. Contact MAO at 1-800-510-4704 for more information. You can also search the DEA website by zip code for a collection site near you. When: Tuesday and Wednesday, April 23-24 from 8:30 a.m. - 3:30 p.m. When: Tuesday rhrough Thursday, April 23-25 from 8:30 a.m. - 3:30 p.m. When: Tuesday through Thursday, April 23-25 from 8:30 a.m. - 3:30 p.m. Remember the 3 R's for safe medicine use - risk, respect, and responsibility. For more information about this national observance and to read about understanding prescription assistance programs and tips on safe storage of your prescription medicines, visit Educate Before You Medicate. Also check out the "Hey Charlie" video and additional information on the Resources for Public page. Drug-Free Work Week is a dedicated time each year to highlight the benefits that drug-free workplace programs bring to employers, workers and communities. And, it's a time to work toward making every week a drug-free work week! To get Drug-Free Work Week resources or learn more about how your organization can participate, visit the campaign home at the National Drug-Free Workplace Alliance.